In this study the chemical composition and iron bioavailability of hull and hull-less soybean flour from the new cultivar UFVTN 105AP was evaluated. The hemoglobin depletion-repletion method was used in Wistar rats. Soybean hull flour presented 37% more total dietary fiber and higher content of iron than hull-less soybean flour. The phytate:iron molar ratio, however, was 2-fold lower in the soybean hull flour in compared to the hull-less soybean flour. Animals fed soybean hull flour presented hemoglobin gains similar to those of the control diet group (p>0.05). The Relative Biological Values of hull and hull-less soybean flour were 68.5% and 67.1%, respectively, compared to the control group. Heat-treated soybean hull flour (150ºC/30 minutes) showed high content of iron and low phytate, which favors the iron bioavailability. Thus, the soybean hull flour is a better source of dietary fiber and iron than hull-less soybean flour at comparable bioavailabilities. Key words: Soybean flour, phytic acid, bioavailability, iron, fiber. Neste estudo foram avaliadas a composição química e a biodisponibilidade de ferro das farinhas de soja com e sem casca do novo cultivar UFVTN 105AP. O método usado foi de depleção-repleção de hemoglobina em ratos Wistar. A farinha de soja com casca apresentou 37% a mais de fibra alimentar e maior teor de ferro (p <0.05) do que a farinha sem casca. Entretanto, o teor de ácido fítico foi superior para a farinha sem casca. A razão molar fitato:ferro na farinha de soja com casca foi duas vezes menor do que a farinha de soja sem casca. O ganho de hemoglobina no grupo da farinha de soja com casca foi similar ao do grupo controle (p>0,05). O Valor Relativo de Biodisponibilidade (VRB) da farinha de soja com casca e sem casca foram 68,5% e 67,1%, respectivamente, em relação ao sulfato ferroso (100%). A farinha de soja com casca submetida ao tratamento térmico (150ºC/30 minutos) apresentou maior teor de ferro e reduzido conteúdo de fitato, favorecendo a biodisponibilidade de ferro. Assim, a farinha de soja com casca apresentou melhor fonte de fibra alimentar e ferro do que a farinha de soja sem casca de comparável biodisponibilidade. Palavras chave: Farinha de soja, ácido fítico, biodisponibilidade, ferro, fibra alimentar. Departamento de Nutrição e Saúde, Universidade Federal de Viçosa, Viçosa-MG, Brazil. Heat treatment of soybeans is commonly performed prior to processing for flour production. However, there are no guidelines as to the best time and temperature to be applied to the grains to inactivate and/or reduce their anti-nutritional phytochemicals that are detrimental of those with functional effects, preserving its nutrients. A study with soybeans under wet extrusion found that the temperature of 126°C for 20 minutes reduced the content of antitrypsin factors improving protein quality. The temperature of 140°C for 20 minutes completely destroyed these antinutritional factors, but reduced protein solubility to a level considered unacceptable (1). The objective of the present study is to evaluate whether the heat treatment will provide improved bioavailability of iron, since the soybean is a source of inositol hexaphosphate (IP6). Thermal treatment may result in partial dephosphorylation of inositol hexaphosphate, producing intermediate compounds as inositol pentaphosphate (IP5), tetraphosphate (IP4), triphosphate (IP3), diphosphate (IP2) and monophosphate (IP1), where this is an advantage of adequate heat treatment since the concentration of IP5 and IP6 may be reduced, decreasing the negative effect on the mineral bioavailability (2,3,4). Comparative studies between hull-less soybean flour (heat-treated 80oC/20 min) made from a conventional cultivar (iron content of 4.5 mg/g), and hull-less soybean flour made from a non-conventional cultivar without two lipoxygenases, (iron content of 4.4 mg/g) showed that soybean flour made from the non-conventional cultivar, which had a higher phytate content, presented lower iron bioavailability (5). Silva et al. (6) observed an increase in protein quality of the soybean hull flours from conventional cultivars treated at 150oC/30 minutes, making the protein concentration similar to the cultivar without the trypsin inhibitor and greater than the cultivars without lipoxygenases. Whole soybean kernels also have high dietary fiber content, but are not commonly used in soybean products. This is the case, for instance, of processed soybean flour in which the hull is removed. The production of soybean hull flour submitted to adequate thermal treatment would be a valuable strategy to increase dietary fiber consumption in the human diet. However, iron bioavailability could be reduced with the increase of dietary fiber and phytate in these new cultivars. This study compared iron bioavailability in hull and hullless soybean flour from a new cultivar (UFVTN 105AP), taking into account dietary fiber and phytate content. Both types of soybean flour were produced and a biological assay using male Wistar rats was conducted, using a hemoglobin iron-depletionrepletion model (7). Thus, the use of soybean hull flour may make it viable to process the whole grain, increasing its nutritional value, as well as eliminating the initial hulling operational step in the industrial processing of the product, reducing costs. UFVTN 105AP is a new cultivar developed by the Soybean Breeding Program of the Biotechnology Institute of the Universidade Federal de Vicosa (BIOAGRO/UFV), using a backcrossing method. It is a high protein content cultivar developed without the enzymes lipoxygenases (LOX1, LOX2 and LOX3). The recurrent parent used to develop UFVTN 105AP was the cultivar Monarca and the donor parents for LOX absence were Japanese cultivars devoid of LOX1, LOX2 or LOX3. The donor parent for high protein content was the North American cultivar BARC-8. Two separate backcrossing programs were initially conducted, one for LOX absence (six backcrossing cycles) and one for high protein content (four backcrossing cycles). After these isolines were obtained, they were intercrossed and after four self-fertilized generations, plants without LOX and with high protein content were selected. Cultivar UFVTN 105 AP seeds were planted in the experimental field of COOPADAP (Alto Paranaiba Agricultural Coop) in São Gotardo, Minas Gerais, in November 2007, and harvested in April 2008. The production of hull and hull-less soybean flour was carried out in three repetitions. On average 917 g of soybean hull flour and 869 g of hull-less soybean flour were produced from four kilograms of the grain for each repetition, removed from a total sample of 60 kg. The kernels were quickly washed with water, dried overnight at room temperature, and submitted to a temperature of 150oC for 30 minutes in a forced air circulation oven (Nova Ética®, Vargem Grande Paulista, Brazil), cooled and stored in polyethylene bags. For the production of soybean hull flour, the grains were ground in a knife mill and passed through a 20 mesh sieve (0.84 mm) (Telastem®, São Paulo, Brazil) using an electric shaker (W.S. Tyler®, Cleveland, EUA). For the production of hull-less flour, after being submitted a similar heating treatment the soybean grains were blended, in a semi industrial blender (Lucre®, Catanduva, Brazil), for short intermittent cycles to promote separation of the dried hulls. The hulls were discarded and the kernel particles were ground in a knife grinder (Brabender®, Rotary Mill model, Duisburg, Germany); 20 mesh flour (0.84 mm) was obtained using an automatic sieve shaker. Protein content levels were determined by the semi-micro Kjeldhal method. Ash levels were quantified by sample incineration in a muffle furnace (8). Carbohydrate content was determined by difference (9). Lipids were extracted with ethylic ether in a Soxhlet apparatus. Moisture was determined in a vacuum oven (105oC ± 1oC), until reaching constant weight (8). Total dietary fiber (TDF), soluble dietary fiber (SDF) and insoluble dietary fiber (IDF) were quantified using the AOAC enzymatic-gravimetric method (10), with modification, i.e., SDF was obtained by the difference between TDF and IDF. Iron content was quantified in samples, according to Gomes et al. (11) with modification, using nitric acid instead of nitric acid:perchloric acid mixture (3:1). One gram of each soybean flour sample was weighed and transferred into a digestion tube, and added 10 mL nitric acid. Digestion proceeded for 16 hours at 150°C. The tubes were removed from the digestion block to cool. The samples were uploaded to a 50 mL volumetric balloon and the tubes washed thrice with deionized water and shaken. Iron content was quantified by atomic absorption spectrophotometry (Varian®, São Paulo, Brazil). Phytic acid was quantified according to methodology described by AOAC (12) and the chromatographic method (ionic pair, Ultrasep ES 100 RP18, 2x250mm) proposed by Sandgerg and Ahderinne (13). One gram of each type of soybean flour was weighed, and extraction was made with 20 mL of HCl 2.4% for 3 hours at room temperature. After centrifugation at 30.000 g for 30 minutes, 1 mL of the supernatant was diluted in 25mL water and injected in the column (0.7 x 15 cm) containing AG1-X8, resin 100-200 mesh). The column was washed with 25 mL water and 25 mL HCl 25 mM. The mioinositol phosphates were eluted with 20 mL of HCl 2M. The eluents obtained were evaporated to dryness and the residue was diluted in 1 mL water. Twenty micro-litters were injected into a High Performance Liquid Chromatograph (HPLC). The mobile phase consisted of formic acid: methanol: water: tetrabutyl-ammonium hydroxide (44:54.5:1.5 v/v); pH was adjusted to 4.25, and a mixture of mioinositol phosphate esters was used as standard. Seventy-two male Wistar rats (Rattus novergicus, albinus variety, Rodentia class from the Central Biotery of the Universidade Federal de Vicosa, Minas Gerais, Brazil), 21-day weanlings, with initial weight ranging from 50-60 g, were individually kept in stainless steel cages under controlled room temperature (21°C ± 1°C) and 12 hour photoperiod for 14 days. The depletion-repletion hemoglobin method was applied to determine iron bioavailability according to the AOAC technique (7), with a modification to the depletion phase which lasted three weeks, instead of four. This time was sufficient to produce anemia in the rats (6mg/dL), based on the results of previous studies in our laboratory. The animals were fed a modified AIN-93G diet (14), recommended to growing phase rats, using salt mix (Fe-free) (Table 1) and deionized water ad libitum, during 21 days to induce anemia. The anemic rats were systematically assigned to groups (n=8) according to their hemoglobin rate to obtain groups with close means. One group was fed the control diet (Ferrous Sulfate), and two other groups were fed the diets tested: soybean hull flour, and hullless soybean flour, each containing three levels of iron (6, 12 and 24 ppm). The diets were prepared according to the AIN-93G (14) with modifications. The repletion diets were formulated by stipulating the amount of hull and hull-less soybean flour as the source of iron (6, 12 and 24 mg/kg diet). The contents of protein, dietary fiber, carbohydrate and lipid provided by both types of soybean flour were calculated to balance the ingredients provided by the AIN-93G diet (Table 1). The ingredients were individually weighed and hand mixed using demineralized plastic tools and mixed in a quasiindustrial mixer (Lieme®, São Paulo, Brazil) at low rotation over 15 minutes. The diets were stored in polyethylene bags under refrigeration at 10ºC. The rats were fed a dose of 16 g/day per repletion diet during 14 days, and deionized water ad libitum. The hemoglobin concentrations were measured again to determine the Relative Biological Value (RBV). The RBV was estimated based on the ratio between the angular coefficient of the slope obtained for hull and hull-less soybean flour and the coefficient of the straight line for the standard diet containing ferrous sulfate. Thus, the control group (ferrous sulfate) was considered equal to 100%, and the relative value of the bioavailability of the hull and hull-less soybean flour was calculated. Hemoglobin levels were determined at the beginning and end of the repletion phase, to calculate hemoglobin gain using the cianometahemoglobin method (Labtest®, Sete Lagoas, Brazil) according to the AOAC (8). Blood samples were collected by tail bleeding. A volume of 20 μL of blood was added to 5 mL of Drabkin’s color reagent. The hemoglobin levels were quantified by UV-visible spectrophotometry at 540nm (Shimadzu ®, Kyoto, Japan). The results were analyzed using the Statistical Analysis Systems - SAS (15) software program, version 9.1, licensed by the Universidade Federal de Vicosa. The chemical composition data were analyzed by the ANOVA test, with the exception of dietary fibers and carbohydrates. The qualitative data were analyzed by the F test, by ANOVA at 5% probability. The Duncan test was used to evaluate the differences among the averages of the treatments. For quantitative data of hemoglobin gain at different levels, the F test was used by ANOVA, followed by regression analysis (16). The animal studies conducted to evaluate iron bioavailability complied with the Guide for the Care and Use of Laboratory Animals (17) and were approved by the Ethical Committee of Animal Experimentation (CETEA) of the Universidade Federal de Minas Gerais, nº 252/2008. The hull and hull-less soybean flour samples showed similar (p>0.05) lipid, ash, and humidity contents: however protein, IP6, IP5 and IP4 contents were higher (p<0.05) for the hull-less soybean flour. Iron content was higher (p>0.05) in the soybean hull flour. The phytate: iron molar ratio was two times lower for the soybean hull flour than for the hull-less soybean flour. The concentration of total dietary fiber, soluble and insoluble, was 37.33 and 64% greater in the soybean hull flour, respectively (Table 2). * Means followed by the same letter in the same column do not differ between itself by ANOVA, 5% of significance #Bio-available iron = total iron x relative iron bioavailability (hull and hull-less soybean flour, 68.5% e 67.1%, respectively). The control and test groups treated with 6, 12 and 24 ppm iron did not present significant difference between the diet consumed and FER (p>0.05). The weight gain of the control group was lower (p<0.05) than that of the groups treated with the soybean hull flour and hull-less soybean flour at the levels of 6, 12 and 24 ppm (Table 3). Weight gain, hemoglobin levels of rats and food efficiency ratio (FER) and of diets with 6, 12 and 24 ppm of iron in the repletion phase. * Means followed by the same letter in the same level (iron concentration) do not differ between itself by Duncan test, 5% of significance. The depletion phase of three weeks was sufficient to produce anemia in the animals, with hemoglobin less than or equal to 6mg/dL (Table 3). In the repletion period, hemoglobin of the animals treated with diets containing hull and hull-less soybean flour at the levels of 6 and 12 ppm was similar to that of the control group (ferrous sulphate). However, the soybean hull flour at the concentration of 24 ppm promoted the best repletion of hemoglobin compared to the hull-less flour. 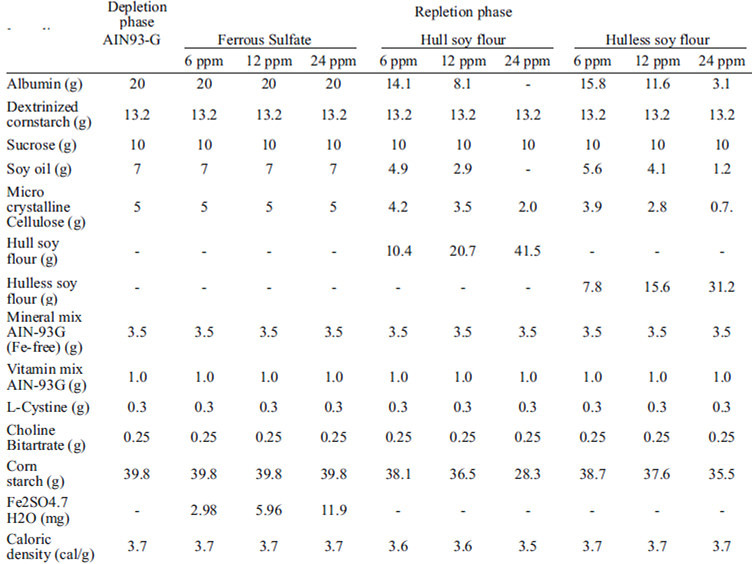 The potential for repletion of hemoglobin gain by the soybean hull flour was similar to ferrous sulphate (Table 3). Hemoglobin gain did not differ (p>0.05) among the experimental groups (date not showed). 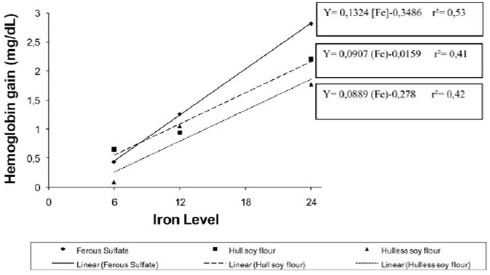 The relative iron bioavailability for hull and hull-less soybean flour was 68.5% and 67.1%, respectively, compared to ferrous sulfate (100%) (Figure1). Soybean hull flour presented an iron concentration of 6.8 mg per 100 g, 4.6 mg of which is bio-available (Table 2). Hemoglobin gain of animals treated with ferrous sulfate, hull and hull-less soybean flour. The high protein content found in soybean flours indicated that soybean is a good protein source with a concentration higher than that found by Esteves et al. (18). Despite the presence of the hull having decreased the concentration of protein in soybean meal, the protein efficiency can be improved by heat treatment. Silva et al. (6) found that soybean meal with hulls in which the grains were treated at 150 º C for 30 minutes presented better indices of protein quality than those without the hull and treated at 130ºC for 30 minutes. The concentration of dietary fiber from soybean hull flour is within the range found by Redondo-Cuenca et al. (19), between 9.19% and 16.5%. However, Esteves et al. 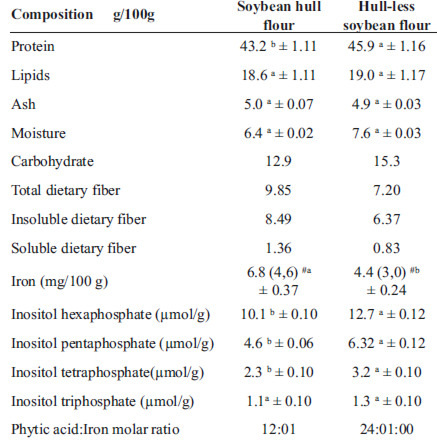 (18) encountered lower values of dietary fiber in soybean meal without hulls. The recommendation for dietary fiber is 15 g/1000 kcal per day (20), thus 100 g of soybean hull flour provides 40% of the daily recommendation, being a good source of dietary fiber. The processing of soybeans for hull flour preparation increased the concentration of iron and reduced the quantity of IP6, IP5 and IP4. This resulted in the reduced phytate:iron molar ratio that was two times lower for the soybean hull flour than for the hull-less soybean flour. Removal of the hull increased the concentration of inositol phosphates, by the fact that it is in greater concentration in the protein fraction of the cotyledon (21). Although food consumption did not differ between experimental groups, the weight gain was lower in the control groups. Ferrous sulfate in the control diets may have caused increase in intestinal transit and consequent reduction of nutrient absorption (22, 23). The potential for the repletion of hemoglobin gain of the soybean hull flour was similar to ferrous sulphate. This result is important as evidence shows that whole grain products reduce mineral bioavailability due to their high content of anti-nutritional factors, such as fibers and phytates (5, 21, 24). The comparison of the two types of flour showed that, although presenting 37% more of total dietary fiber, soybean hull flour had around 22% lower levels of inositol penta and hexaphosphates, the main inositol forms affecting iron bioavailability (25). A previous study of our group showed that a soybean cultivar with higher phytate content presented lower iron and zinc bioavailability (5). In fact, phytic acid is said to be structurally integrated with proteins and/or minerals in the complex form (26), being more concentrated inside the grain than in the external tissue. This would explain the high phytic acid content in hull-less soybean flour, which can negatively affect iron bioavailability. Phytate: mineral molar ratios are useful to predict their inhibitory effect on mineral bioavailability (27). Phytate:iron molar ratio > 1 was found to impair iron bioavailability (28), while Saha et al. (29) found that phytate:iron molar ratio >14 decreased iron bio-availability in wheat flour. In this study, hull soybean flour presented a phytate: iron molar ratio of 12:1, while hull-less soybean flour achieved (24:1). Such difference may explain the higher iron bioavailability for hulled soybean flour. The lower the molar ratio presented, the lower the linking strength between phytate and iron. Another factor that may have optimized the relative iron bioavailability of hull and hull-less soybean flour in relation to ferrous sulphate was the thermal treatment applied. A previous study in our laboratory applying different heating treatments showed that temperature of 150ºC over 30 minutes was more efficient, promoting a lower urease index (unpublished data), an indicator of inactivation of anti-nutritional factors (30). Soybean hull flour submitted to the heating treatment of 150ºC for 30 minutes resulted in a good source of dietary fiber and iron, with a lower concentration of phytate and thus a lower phytate:iron molar ratio than the hull-less soybean flour. Iron bioavailability of the soybean hull flour was comparable to ferrous sulfate. Thus, the soybean hull flour is a nutritious source of dietary fiber and iron and allows for elimination the initial hulling step in the industrial processing of soybean flour. We thank the Ralph Greiner Biological Molecular Centre and the Federal Research Centre for Nutrition and Food, Germany, for their assistance in phytate analysis. Perilla NS, Cruz MP, de Belalcázar F, Diaz GJ. Effect of temperature of wet extrusion on the nutricional value of full-fat soybeans for broiler chickens. Br Poultry Sci 1997, 38(4): 412-416. Davidsson L, Dimitriou T, Walczyk T, Hurrell RF. Iron absorption from experimental infant formulas based on pea (Pisum sativum)-protein isolate: the effect of phytic acid and ascorbic acid. Br J Nutr 2001, 85: 59-63. Hurrell RF, Reddy MB, Juillerat MA, Cook JD. Degradation of phytic acid in cereal porridges improves iron absorption by human subjects. Am J Clin Nutr 2003, 77: 1213-1219. Troesch B, Egli I, Zeder C, Hurrell RF, Pee S, Zimmermann MB. Optimization of a phytase-containing micronutrient powder with low amounts of highly bioavailable iron for in-home fortification of complementary foods. Am J Clin Nutr 2009, 89: 539-544. Martino HSD, Martin BM, Weaver CM, Bressan J, Esteves EA, Costa NMB. Zinc and Iron Bioavailability of Genetically Modified Soybeans in Rats. J Food Sci 2007, 72: 2413-2420. Silva CO, Andrade GF, Dantas MIS, Costa NMB, Peluzio MCG, Martino HSD. Influência do processamento na qualidade protéica de novos cultivares de soja destinados à alimentação humana. Rev Nutr 2010, 23(3). AOAC. Association of Official Analytical Chemists. Official methods of analysis. 14th ed. Washington, D.C. 1984. AOAC. Association of Official Analytical Chemists. Official methods of analysis of the AOAC International. 16th ed. Maryland, 1997. Brasil. Ministério da Saúde. ANVISA. Regulamento técnico para rotulagem obrigatória de alimentos e bebidas embalados. Resolução RDC nº 40 de 21 de março de 2001: Agência Nacional de Vigilância Sanitária. AOAC. Association of Official Analytical Chemists. Official methods of analysis. 15th ed. Washington, D.C. 1992. p.136-138 (suppl 3). Gomes JC, Silva MHL, Silva CO. Análise de Alimentos. 2ª ed Revista e atualizada. Viçosa: FUNARBE, 2003. 153p. AOAC. Association of Official Analytical Chemists. Official methods of analysis. 15th ed. Washington, 1990. Sandberg A, Ahderinne R. HPLC method for determination of inositol tri-, tetra, penta-, hexaphosphates in foods and intestinal contents. J Food Sci 1986, 51: 547-550. Reeves PG, Nielsen FH, Fahey GCJr. AIN-93 purified diets for laboratory rodents: final report of the American Institute of Nutrition Ad Hoc Writing Committee on the reformulation of the AIN-76 rodent diet. J Nutr 1993, 123: 1939-1951. SAS-Statistical Analysis Systems for Windows. Version 9.00. SAS Institute, Cary, North Caroline (Software), 2002. Vieira S, Hoffmann R. Estatística Experimental. São Paulo, Brazil: Atlas, 1989. 179p. Natl. Research Council Guide for the care and use of laboratory animals. Publication. No. 85. Washington, D.C.: NIH, 1985. Esteves EA, Martino HSD, Oliveira FCE, Bressan J, Costa, NMB. Chemical composition of a soybean cultivar lacking lipoxygenases (LOX2 and LOX3). Food Chem 2010, 122: 238-242. Redondo-Cuenca A, Villanueva-Suárez MJ, Rodrígues-Sevilla MD, Mateos-Aparicio I. Chemical composition and dietary fibre of yellow and green commercial soybeans (Glycine max). Food Chem 2006, 101: 1216-1222. IOM. Institute of Medicine and Food & Nutrition Board. Dietary Reference Intakes for Energy, Carbohydrates, Fiber, Fat, Fatty Acids, Cholesterol, Protein, and Amino Acids (Macronutrients). Washington, DC: National Academy Press, 2002. Domínguez BM, Gómez MVI, León FR. Acido fítico: aspectos nutricionales e implicaciones analíticas. Arch Latinoamer Nutr 2002, 52: 219-231. Benoni G, Cozzolin L, Zambreri D, Donini M, Del Soldato P, Caramazza I. Gastrointestinal effects of single and repeated doses of ferrous sulphate in rats. Pharm Res 1993, 27(1): 73-80. Simmous WK, Cook JD, Bingham KC, Thomas M, Jackson J, Jackson M, Ahluwalia N, Kahn SG, Patterson AW. Evaluation of a gastric delivery system of iron supplementation in pregnancy. Am J Clin Nutr 1993, 58: 622-626. Chiplonkar SA, Agte VV. Predicting Bioavailable Zinc from Lower Phytate Forms, Folic Acid and Their Interactions with Zinc in Vegetarian Meals. J Am Coll Nutr 2005, 25: 26-33. Lopez MAA, Martos FC. Iron availability: An updated review. Int J Food Sci Nutr 2004, 5: 597-606. Stipanuk MH. Biochemical and physiological aspects of human nutrition. Philadelphia, Pa: WB Saunders Co, 2000. 1007p. Ma G, Jin Y, Piao J, Kok F, Guusje B, Jacobsen E.. Phytate, Calcium, Iron, and Zinc Contents and Their Molar Ratios in Foods Commonly Consumed in China. J Agric Food Chem 2005, 53: 10285-10290. Hallberg L, Brune M, Rossander L. Iron absorption in man: Ascorbic acid and dose-dependent inhibition by phytate. Am J Clin Nutr 1989, 49: 140-144. Saha PR, Weaver CM, Manson AC. Mineral bioavailability in rats from intrinsically labeled whole wheat flour of various phytate levels. J Agric Food Chem 1994, 42: 2531-2535. Wiriyaumpaiwong S, Soponronnarit S, Prachayawarakorn S. Comparative study of heating processes for full-fat soybeans. J Food Eng 2004, 65: 371-382.